Step away from the usual traditional bouquets for a moment, and branch out with the modern and funky Leah. This innovative bouquet features a unique blend of pom pom-esque green button chrysanthemums, saffron gerberas, sunshine yellow lilies, dainty irises and deep magenta alstromeria. Complemented by lush foliage and wrapped in distinct purple paper and ribbon, this carnival of colour is a vibrant gift suitable for most occasions. 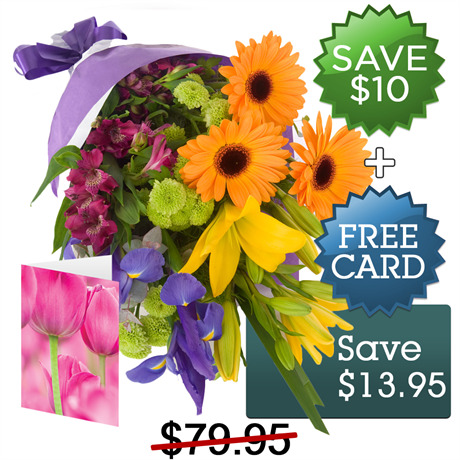 Bring in a birthday, congratulate a colleague, or show a loved one your spontaneous side with this surprise bunch of blooms.